Reversible cement darts are a new Benoil range, developed from the range of standard cement darts. As the name suggests, these darts can pass in either direction inside the coil tubing. The dart fins have been specially developed to allow the dart smooth passage through the coil tubing. As with conventional cement darts, the colour coding denotes the pressure rating of the darts. A higher pressure and lower pressure dart are usually selected for the top and bottom dart to allow for the hydrostatic pressure generated by the cement column. These darts are designed to be loaded into the coil, before the CT is deployed. This is done by loading the top dart, then the cement column and then the bottom dart � from the bottom of the tubing rather than the top. When the CT, cement darts and cement column is in position at the depth required, the top dart is triggered conventionally and the cement is deployed. This has the advantage of deploying exactly the correct amount of cement where it is needed, and does not contaminate the CT with cement. 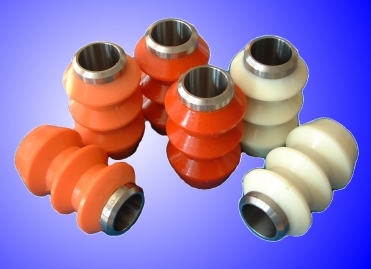 Shown here are a few reversible cement darts for 1-3/4�CT, but other coil sizes are available. Any of the existing cement dart burst pressures can be offered in this form. However, the pressures can be tailored if needs be. As with conventional cement darts, they will pass a drop-ball post-rupture to act as a trigger for other subsequent operations, should this be necessary.